You often read here, or perhaps have seen me tweet about wines with soul; the wine pictured above is one which fits nicely in that category. It’s a wine of pure terroir, breeding and its apparent great care went into producing this beauty. It's not some 'cooked' laboratory produced [breaking-bad] freak oozing mega purple or any other odd additives found in far too many wines today. No folks [IMO] this wine is the real deal. So yes while a bottle of wine like this is pricey, it's worth every penny to uncork something which makes you tilt your head back in amazement. Hopefully, while truly appreciating what it takes to make wine that says, "yes I came from somewhere". "The genius of La Spinetta; is that it encompasses a vast array of great wines, all boasting Giorgio Rivetti's inimitably approachable and voluptuous style." Having had an opportunity to taste a good cross-section of the wines he produces I'd have to say I concur with the above statement. But I'd have to say further, that in my opinion, his real strengths lie in Piemonte. The 2003 La Spinetta, Vigneto Starderi, Barbaresco is a wine that is voluptuous in style, but its approachability is a matter of time. This is a wine I'd recommend to purchase the case, drink the first one after ten years in the cellar and then one bottle every five years thereafter. This wine has fantastic structure, tannins, and bright acid plumbed through it abundant fruit. A real powerhouse, of finesse and layered like a beautiful painting just waiting for you discover all of its secrets. If you never experienced these wines before, I'd invite you to do so at your earliest convenience. The [I assume] even more suave and sophisticated Barolo he produces starts well above $130, so, by comparison, the Barbaresco is a bargain selling for $85 to $100 on a few sites. "Similar to its more famous sibling Barolo, Barbaresco is made from 100% Nebbiolo and shares its cult status as one of the finest wines in the world." It was an exciting lesson in comparing vintages, [2003 vs. 2009] same vineyards and similar productions methods were used. The wine is aged entirely in new, medium toasted French oak for about 20 – 22 months before being ready for stainless-steel vats, where the wine hangs out for 3 months before bottling, and then once more a bit more aging in bottles for another 12 months before release. 2009 La Spinetta (Rivetti) Barbaresco Vürsù Vigneto Starderi: An odd smokey meat aromas, heading toward prune, baked flavors. High toned drying tannins, earthy, florals, dried fruit. A very rustic wine at the moment, still maturing and refining. In the glass; the color is a rustic garnet color toward brick at the rim. Not an easily approachable wine in the short term. This wine needs 10 years minimum before I'd even consider uncorking it, but the potential for greatness is already there. My Score: 91 points. 2003 La Spinetta (Rivetti) Barbaresco Vürsù Vigneto Starderi: The tannins are still present, but much more mild and integrated far back into the background. A strained tobacco color stains the glass. Tar, tobacco, oxidized prune colors and aromas jump quickly from the glass and smack my senses with delight. After just a few moments in the glass, the tannins begin to soften and integrate! Suave, sophisticated and smoky dried fruits, rich earth. 10 years to the day, to perfection. My Score: 94 points. 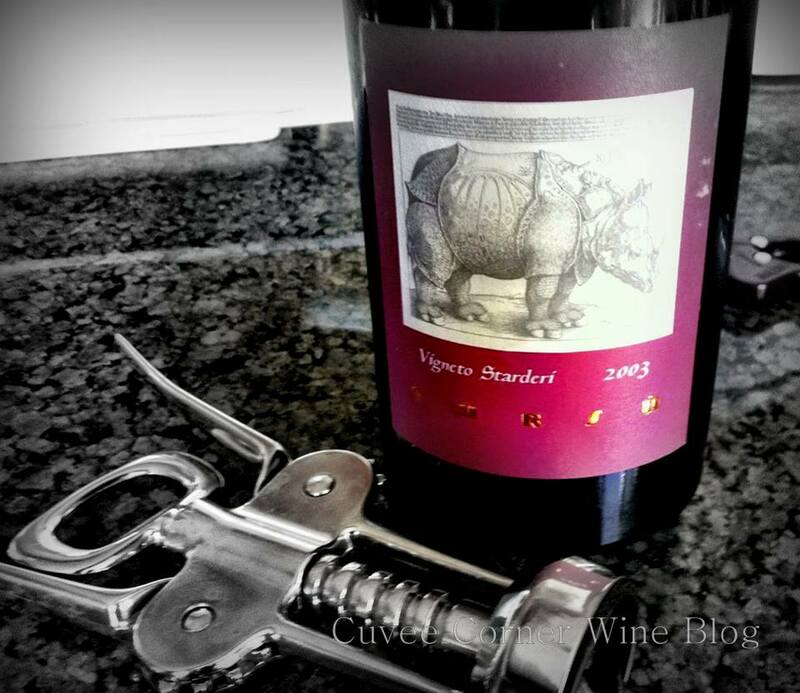 A wine of immense structure and stature, this Barbaresco like the Rhino on the label is enormous; but oddly at the sweet baked red/blackberries coupled with a medium to dense body wine sporting a silky texture and a long-lasting savory finish that gives and gives. This wine could easily go another 10 years in bottle, I'm sure it'd be far more interesting. Until next folks remember life is short, so sip long and prosper cheers!